Whether it is a hot summer day or the holiday season, ice cream and gelato are well-loved frozen desserts enjoyed by people of any age (although some consider gelato to be the "grown-up" version of ice cream). The two look and taste similar, but are they actually the same? Taking into account gelato is the Italian word for ice cream, you would think so, but there are actually a few differences between the two. From the ratio of milk to cream, to how the mixture is churned, to the flavors and textures, there are specific distinctions between ice cream and gelato. Two of the main ingredients in both ice cream and gelato are milk and cream, but it is the amount of each that results in differing desserts. As the name implies, "ice cream" contains more cream than milk, whereas gelato is made with a greater proportion of whole milk to cream. Another ingredient that distinguishes the two is eggs; ice cream includes egg yolks while gelato is (most often) completely void of eggs. These differing measurements and ingredients affect the amount of fat in each dessert, as well as the mouthfeel (the texture of the food in your mouth as you eat it). Legally, ice cream has to have a minimum of 10 percent fat; gelato contains only 5 to 7 percent fat. It is not just the ingredients that separate the two, it is also the way that each is made. Ice cream and gelato must be churned to create that creamy, scoopable goodness, but it is the speed at which they are churned—and the resulting amount of air incorporated—that is different. Gelato is churned at a slower speed than ice cream, which creates a denser consistency since less air is whipped into the mixture. Gelato contains about 25 to 30 percent air, while ice cream can contain as much as 50 percent air. 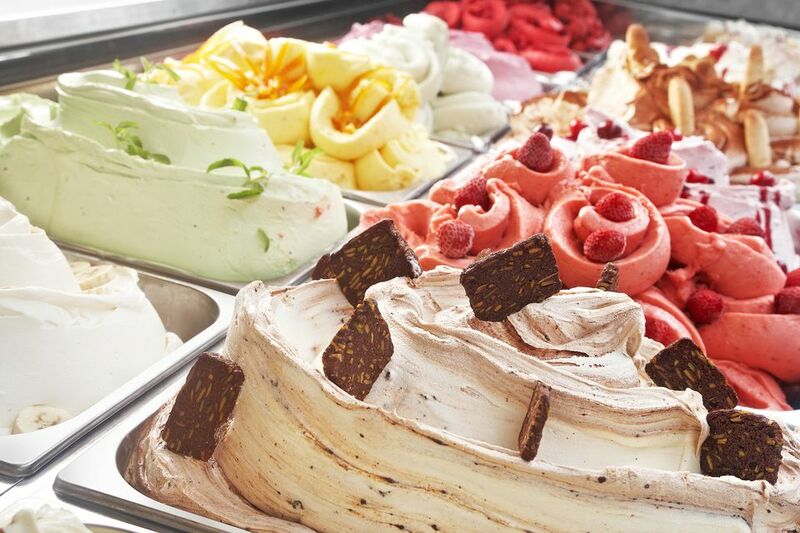 Once the ice cream and gelato are made, they are stored at certain temperatures to maintain the right consistency. Ice cream is typically served frozen, around 0 F, whereas gelato is typically stored and served at a slightly warmer temperature, around 15 F. This means gelato is not quite completely frozen, making the texture softer and silkier than ice cream. Illustration: Bailey Mariner. © The Spruce, 2019. Stop into any ice cream parlor or peak inside the case at the supermarket, and you will witness the expansive array of flavors, from traditional vanilla and coffee ice creams to somewhat unusual flavors such as sweet basil and sweet potato. But when it comes to gelato, the flavor profile is much more narrow. There are a few classics you'll find in gelato form—vanilla, chocolate, hazelnut, and stracciatella (vanilla with crunchy chocolate pieces), as well as pistachio, tiramisu, and a variety of fruit flavors—but not necessarily the type of combinations you see in the ice cream aisle. The differences in both treats' compositions and the way they are stored affect the way they taste and feel in your mouth. Fat coats the tongue, creating a layer between the taste buds and the food you are eating, and colder food numbs the tongue a bit, making it more difficult to actually taste the food. Since gelato has less fat and is warmer than ice cream, the flavors come through more and are more intense. These factors also make for a smoother consistency whereas ice cream has more of a fine crystal texture. Is Gelato Really More Flavorful Than Ice Cream?